We would like to congratulate Mrs. Carla Tew on receiving the Herman Moore LAMP Award of Exceptional Service on Tuesday, September 18th in Montgomery at the Alabama Library Expo Conference. 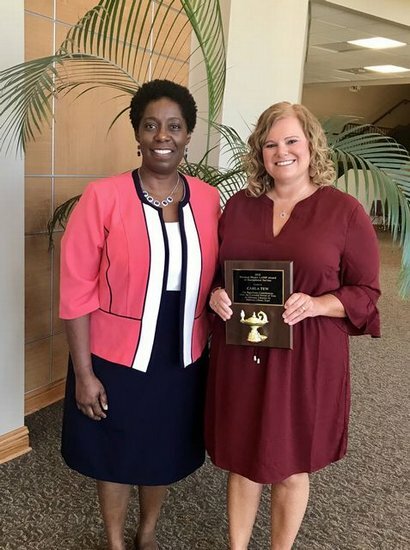 The Herman Moore LAMP Award of Exceptional Service is awarded annually by Alabama Library Expo to librarians and library media specialists who have rendered outstanding and exceptional service to their patrons, schools, and communities over an extended period of time. Mrs. Saffold was in attendance to support Mrs. Tew at the Expo Awards Ceremony.